Leadership education has become an essential outcome of higher education in the past decade and yet leadership development efforts vary greatly on campuses. In response, the International Leadership Association (ILA) published Guiding Questions: Guidelines for Leadership Education Programs. The Guiding Questions document is a result of a five–year, collaborative process to create guidelines for leadership education programs. ILA s format of open–ended guiding questions is applicable to any student affairs practitioner developing a leadership learning program. This sourcebook was developed specifically to assist higher education professionals in their understanding, conceptualization, and implementation of the five standards outlined in the ILA Guiding Questions: Context, Conceptual Framework, Content, Teaching and Learning, and Assessment of Leadership Education. It explores leadership education for undergraduate students and provides a foundation for readers to develop students leadership capacity. Using the ILA s Guiding Questions as a framework, this sourcebook will enable you to develop a leadership education program on your campus. This is the 140th volume of this Jossey–Bass higher education quarterly series. An indispensable resource for vice presidents of student affairs, deans of students, student counselors, and other student services professionals, New Directions for Student Services offers guidelines and programs for aiding students in their total development: emotional, social, physical, and intellectual. 1. 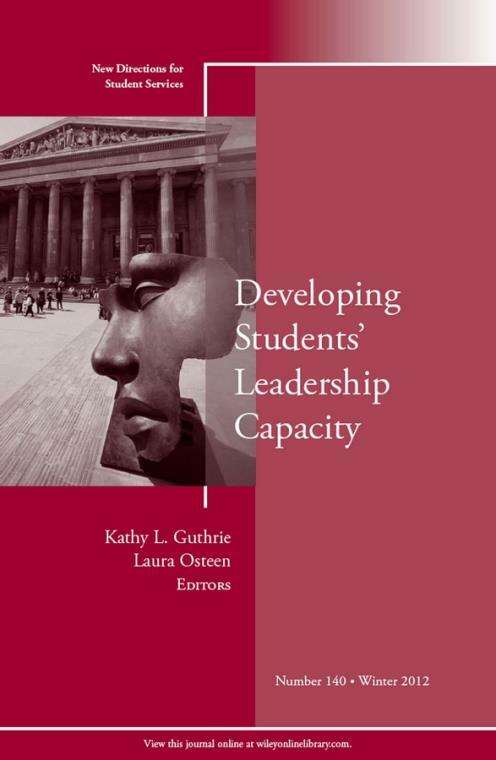 Considering Context: Developing Students′ Leadership Capacity 5Laura Osteen, Mary B. CoburnContextual factors infl uence the development of students′ leadership capacity in higher education, and this chapter explores such factors in leadership education. 2. Using Student Development Theories as Conceptual Frameworks in Leadership Education 17Julie E. OwenConceptual frameworks are necessary to establish leadership education programs, and connecting those frameworks to program design is essential. 3. Leadership Pedagogy: Putting Theory to Practice 37David M. Rosch, Michael D. AnthonyThis chapter discusses how theories of leadership and pedagogy inform effective practice in leadership development. 4. Teaching and Learning: Using Experiential Learning and Reflection for Leadership Education 53Kathy L. Guthrie, Tamara Bertrand JonesSpecific applications of experiential learning in leadership education are explored. 5. Leadership Online: Expanding the Horizon 65Kirstin PhelpsChallenges of, lessons from, and effective practices for leadership education online are discussed. 6. Using Standards to Develop Student Learning Outcomes 77Susan R. Komives, William SmedickThe Council for the Advancement of Standards (CAS), National Association of Campus Activities (NACA), and the International Leadership Association (ILA) Guiding Questions provide standards of quality for leadership programs. 7. Exploring Local to Global Leadership Education Assessment 89John P. DuganBecause assessment is critical in developing and sustaining leadership education, this chapter considers assessment techniques and trends spanning local and global frameworks.